Ice Climber, despite the self-explanatory title, is more complex than a cursory glance would suggest. Popo the parka-toting lad (and identical twin Nana in the multiplayer mode) must scale thirty-two vertically scrolling mountains to rescue a large number of delicious eggplants, using only wits and indestructible hammers to do so. While simple in theory, you’ll have to devise a host of nifty tricks to outsmart the bad guys and save yourself from slipping into the darkened pits below. Unfortunately, you’ll have fight a great foe before clawing your way to success: the controls. There’s a lot going on in this tiny game, but that doesn’t always make it fun to play. Layers of multicoloured ice in the form of rectangular blocks loom high above, forcing you to make like Mario and bash them from below. Create a Popo-sized hole in the blockade and you’ve just bought yourself a ticket to the next platform, assuming you can finagle yourself through the gap. Getting used to the odd, unforgiving trajectory of leaping skyward yields rewarding dividends, but satisfaction from a job well done is not immune to frustration’s cruel sucker punch. 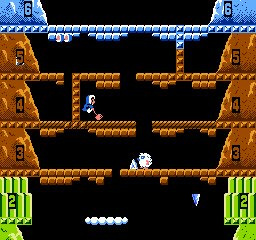 That’s where Ice Climber begins to falter: a great platformer should deal in precise, responsive jumps; not in finagling. That doesn’t mean the fiddly movement of Ice Climber is insurmountable; in fact, the truly rugged explorer may hack his way through the unyielding ice to discover treasures hidden beneath the surface. The many moving parts of a given level will keep you always on alert, whether you’re fending off pterodactyls with a brave swing of the hammer or hopping from cloud to cloud as they dash across the area. Survival requires a keen attention to detail and plenty of patience, not to mention an improviser’s heart. When you’re halfway up the mountain and a roly-poly yeti nudges a block of ice to plug up your escape route, you’d better have a plan swiftly forming in your head, lest the conveyer belt sweep you right to death’s doorstep. Although the awkward controls will do you no favours in these do or die moments, pounding your head incessantly against the icy slopes will increase your skill little by little. You might even gain an appreciation for this rigid brand of pixelated spelunking by the end. 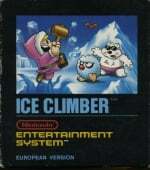 A certain amount of clumsiness can be explained by Ice Climber’s origins, even if that doesn’t excuse it. Its Japanese release in 1985 marked the dawn of Nintendo’s foray into home consoles, when a platformer’s fun factor was still uncharted territory. This is a game very much rooted in classic arcade-style action; hence the screen edges that warp you to the opposite side, a focus on high scores, and timed bonus stages that occur at each level’s peak. There’s also a co-op mode that allows two players to scramble after vegetables together, but this only emphasizes the more irritating aspects of climbing a mountain poorly. A toe-tapping soundtrack and bright colours are pleasant if unremarkable, clearly stamping the whole package as an NES game through and through. Unlike other heroes of the time, Popo and Nana never found their way to a glorious sequel, merely appearing in the Super Smash Bros. series and a few scattered cameos. 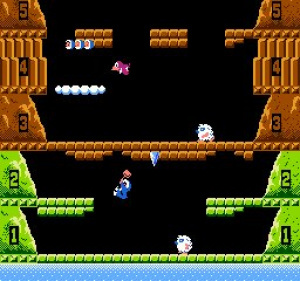 As a historical artifact, Ice Climber is worth examining, particularly considering the Wii U’s off-screen play via the GamePad. While purists may want to track down the original cartridge and 3DS Ambassadors already own a portable version, you could do worse with modest funs and some curiosity. Purely as a video game, however, the game struggles. Ice Climber’s concept is solid and the components for a real classic are all there, but the execution drops an icepick on the proverbial foot of success with too much regularity to safely ignore. Gritting your teeth and overcoming the troublesome controls could lead you to the tallest mountain as you commit the smallest of tactics to memory along the way, and there’s an honest to goodness enjoyment in such a victory. Yet looking down from the top reveals a poignant message: Ice Climber doesn’t play very well, and no amount of clever design can change that. Scale at your own risk. I re-downloaded this last week since it was only a buck... let's just say I've obviously been playing a dramatically larger amount of Super Mario World than this. It's cool to have, but I agree with this review--the controls are frustrating. I hope they make a remastered version where they sharpen the controls someday. Maybe even make the whole thing HD. I already have the ambassador version. Definitely not one of my favorites. I've always liked this game despite the bad controls, but it was too hard for me to ever make much progress. I'm thinking this could be fun to cheat with save states and get through the whole thing. So I'm gonna buy it. have you guys ever tried to climb an icy mountain? it is not that easy and it is hard to even control yourself! @ikki5 Exactly how would that knowledge make the game more fun? I like the game though, the controls are just different... it adds to the challenge. If it controlled as well as Mario there would be zero challenge in the game. I've always loved this game so instant buy for me. Bad controls, bad collision detection, average graphics... Bad game. 5$/€ is a joke. A remake that solves all its issues and nice graphics (Smash Bros Brawl style) would be worthy of a 10€ price tag. Nintendo's worst first party title (yes even worse than Urban Champion). Wish they would stop re-releasing crap like this for every VC. I got it from the ambassador program for 3DS, and the review is spot on. Perhaps Nintendo could try their luck at another Ice Climbers game, since it's hard to justify the inclusion of the Ice Climbers in the Smash Bros. series when they've only had a single game to their name. This game always sort of struck me as an odd one. Dunno if it's because of the controls but.. eh, I dunno. If they sometime rework the controls and physics of the game then this could be quite a fun game. One of my favorite NES Classics of all time! 10 out of 10! 5? Are you guys crazy? My Wii U is in my bedroom. My sister's hangout room is in the basement, directly below me. I have near perfect Wii U reception down there. Off TV play is enough reason for me to update all my Wii VC games if they become available. Ice Climber is fun for those short bursts. Honestly, any game from the NES era is exempt from poor scores if you ask me. Unless they're AVGN scorned bad, then it deserves a bad score. Why do they price them so high? Not sure why but I love this game still. I've honestly been waiting for a sequel forever and still have been hoping it gets the KI:U treatment that others have mentioned too. The sooner they can get this central account thing situated the better. Maybe this is why the Ice Climbers in Smash Bros have such poor traction despite having snow shoes. @grumblegrumble Yep, they're crazy. They should have given it a lower score. 5 is too high. Ice Climber comes from a place where you have to be good to play it, it doesn't reward being inept and it will continue to punish you for it indefinitely. This will leave players with a Marmite style opinion of it. People expecting Super Mario (or normal Mario for that matter) won't understand it at all. A lot of these early NES games were Nintendo exploring the concept of a platform, or even defining it. I think this is a route that should've been explored more, I for one think its a brilliant game and concept and execution and truly rewards the player if they invest. What it lacks in immediacy it makes up for in serious quality game play. Considering the complexity and nuance of the controls its a shame NintendoLife have decided to be down on it. 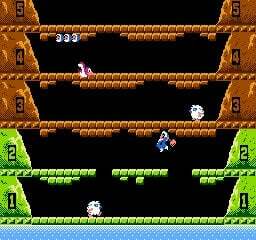 But hey, I guess that's why there isn't Ice Climber Galaxy 2, Ice Climber Party 8 or even Ice Climber Kart. Glad i got this free on the ambassador scheme. I had a couple of play sessions on it and just couldn't get into it. I thought the worst thing about the game was the dodgy collision detection, to often you will just slip through the edges of moving platforms. I've still yet to update to the full version, but save states for this would seem useless as all levels are selectable from the title screen anyway. imo it was the weakest of the ambassador titles. For me the clunky controls where a part of the challenge. This game works best with a friend, when its a frantic race to the top. This is an interesting relic from back before anyone had defined what jumping mechanics 'should' be. Mario has pretty much become the symbol of what good platforming should feel like, and while Mario is great, it's not always a great thing when one franchise gets to dictate how a whole genre should operate. I always appreciate a healthy bit of experimentation, even if it means the controls will take some to get used to. That said, this game is HARD, and the controls are infuriatingly illogical. I think Ice Climber definitely deserves more than a 5/10, especially when borderline unplayable Metroid and Kid Icarus get 7s and 8s.